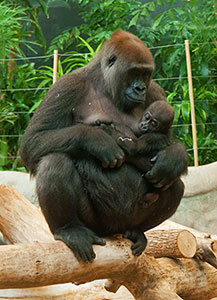 Our male gorilla baby, Sulaiman, is now nearly 7 months old and weighs about 6 pounds. His keepers are enthralled by his development since he is the only baby gorilla at the Zoo, and the last surviving gorilla birth was in 1992. Sulaiman has a very close bond with his mother, Shalia. She is very protective of him, and the other gorillas in the troop only have contact with him as much as his mother will allow. Currently, Sulaiman’s diet consists of only breast milk. As the summer goes on, Sulaiman will start to eat solid foods and venture away from his mother more often. Sulaiman can be seen on exhibit with mom, either indoors or outdoors, almost daily. Soon, he’ll start to interact more with the other gorillas in the troop.